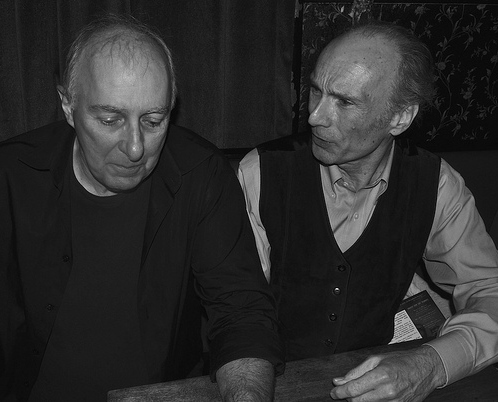 If you’ve ever been to a reading at KGB, you know why it’s so highly regarded. If you haven’t, you should start planning your trip now. The Fantastic Fiction Series hosted by Ellen Datlow and Matthew Kressel runs the third Wednesday of every month in KGB’s Red Room — an intimate space that fills up quickly. Readings start at 7:00, but it’s a good idea to get there early if you want a seat. Among those attending our readings were Meghan Arcuri, Daniel Braum, Trevor Firetog, Karen Heuler, Jack Ketchum, and Christine Cohen, Vaughne Hansen and Will Reeve of the Virginia Kidd Literary Agency. 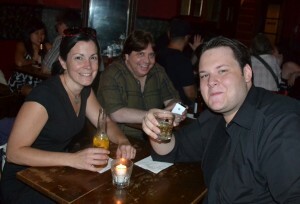 That’s Meghan and Trevor above right, sitting with SHU Popular Fiction writer Tom Connair. Our event kicked off with Matthew Kressel (left) announcing the roster of upcoming readers, an impressive list featuring Elizabeth Hand, Kathe Koja, Rio Youers, and others. My selection for the night was “Beneath Between,” which originally appeared in The Stories in Between and has since been included in Voices (my 2011 print collection that is due to be released in ebook this fall). The story is a contemporary fantasy about the sf genre, and I was keen to perform it for an informed audience of readers and writers who would catch its many inside references. I wasn’t disappointed. They were a perfect audience. For his reading, Tom Monteleone performed the story “Horn of Plenty,” a tale originally released as part of Dark Voices, the well-regarded audio series from Borderlands Press. Tom has always been one of my favorite readers. A true 21st-century scop, he knows that reading live involves more than showing up with the printed text and a willingness to read it. He prepares his work, rehearsing the voice and timing to guarantee a dynamic and nuanced presentation. When space permits, he breaks the fourth wall by walking through the audience as he reads. 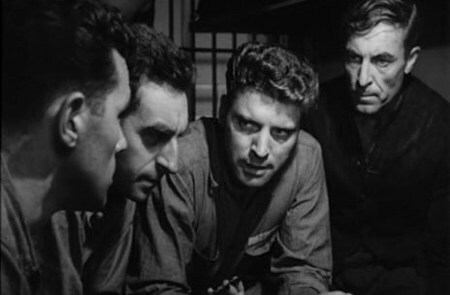 Although the tightly packed crowd at the KGB didn’t permit such mingling while reading, Tom nevertheless managed to break down that fourth wall of performance without leaving the podium. Intimate and personable, his story about musical obsession was well suited for the venue (especially when music from a Salty Brine show on an adjacent stage filtered into to Fantastic Fiction space). In all, it was a great night. The next morning, waking up in a Midtown room that looked out on the art-deco face of the historic New Yorker Hotel, I was ready to do it all again. Tom Monteleone and The 21st-Century Scop in a pre-performance meeting at the KGB. Photo copyright © 2015 by Ellen Datlow. Meghan Arcuri, Tom Connair, and Trevor Firetog get ready for the show. Photo copyright © 2015 by Ellen Datlow. 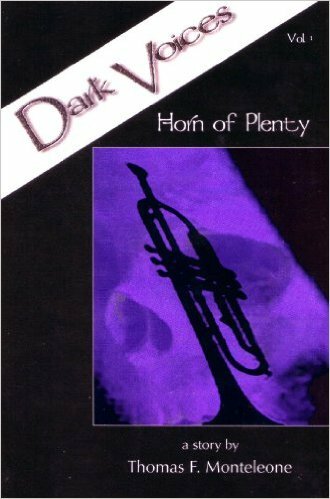 Cover of Dark Voices Volume 1: Thomas F. Monteleone’s Horn Of Plenty. Art and cover design copyright © 2015 by Borderlands Press. 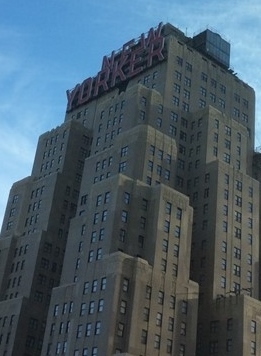 The New Yorker Hotel. Photo copyright © 2015 by The 21st-Century Scop. This entry was posted on Saturday, September 19th, 2015 at 12:22 pm and is filed under 21st-Century Scop. You can follow any responses to this entry through the RSS 2.0 feed. You can leave a response or trackback from your own site. Powered by WordPress and delivered in 0.221 seconds using 48 queries.